Yay! Originally uploaded by Crystl. I love this return address sticker. Functional and fun. 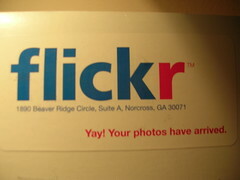 The folks at flickr know exactly how you feel when you get something in the mail that isn’t a bill you have been expecting and will likely be excited to see. Posted bymatto 13 December 2005 Posted inHoly Crap! That's Cool!